With a done deal in the books and the Phillies having acquired the second of two well known All-star pitchers named Roy, let's go over some things. The Astros are sending an undisclosed amount of cash to the Phillies in the deal along with Roy Oswalt for "Jay" Happ, Jonathan Villar and Anthony Gose. Physical examinations could still throw a wrench into the trade. Oswalt has struggled with back issues, having missed time as recently as last September because of the ailment and receiving at least two cortisone shots this year to alleviate his back discomfort. Also, lefty pitcher "Jay" Happ, who is being sent to Houston, missed a considerable amount of time this year with a forearm strain. The Astros will likely need to clear Happ's health status before everything is final. Gose, a speedy left-handed hitting outfielder, led planet Earth in stolen bases last season as a member of the Class A South Atlantic League Champion Lakewood BlueClaws with 76 swiped bags. This season, at High-A Clearwater in the Florida State League, Gose, 19, has posted a .263 average with 4 homers and and 36 steals in 103 games. Click here and here to check out exclusive PhoulBallz.com interviews with Gose. Villar is a shortstop prospect who was signed as an amateur free agent out of the Dominican Republic in 2008. The 19 year old was surprised by the move, but not upset. Speaking through a translator, Villar stated that he was looking forward to moving up toward the Majors, and implied that it did not matter which organization he did that for. His focus will stay on improving as a ballplayer. "I don't want it to effect the way I play. I just want to keep working hard," Villar said before saying goodbye to his Lakewood teammates. Villar, a switch hitter, has impressed folks throughout the Phillies' system, most recently Phillies advisor, and former team general manager, Pat Gillick, who visited with the team this month. In 100 games with Lakewood this season, Villar was batting .272 with 2 homeruns, 36 RBI and 38 steals. A positional switch could be in Villar's future, as he has made 42 errors this season with the Class A BlueClaws. 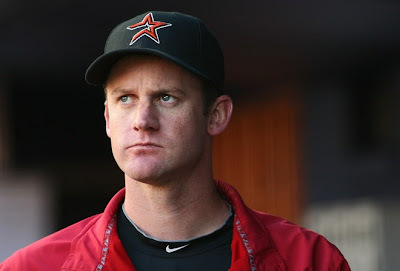 The trade was held up overnight as Houston awaited confirmation from Oswalt on whether he would waive his no-trade clause and accept the deal to Philadelphia. Jim Salisbury of Comcast Sportsnet reported Thursday morning that Brad Lidge reached out to his former Houston teammate Oswalt via text message, in an effort to convince the Astros righty to approve the deal. In 5 career starts in Philadelphia, Oswalt has a 4-1 record with a 2.94 ERA. He is 4-0 in 4 starts at Citizens Bank Park. And keep in mind, that's facing the Phillies...not the NL East opponents they see most of the time. Against the other four teams (Atlanta, Florida, NY Metropolitans and Washington) within the division, Oswalt is a combined 13-14 with a 4.09 ERA in 45 games in his career. **Update** Reports state that Anthony Gose is being flipped to Toronto for Brett Wallace, who was traded by Oakland last offseason for Michael Taylor, who was included in the Roy Halladay trade.